In its latest incarnation (summer 2010), Windows Live Hotmail added a new feature that allows you to group messages by conversation thread, in much the same way as Gmail presents your email messages and inbox (among others). This approach has some clear benefits, especially if your include yourself in all email replies, but it also takes getting used to. 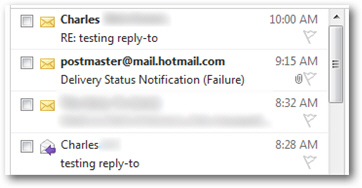 As often, Hotmail lets you customize this setting to your liking, and you can quite easily disable grouping email messages by conversation - and revert to the old Hotmail, original option, which is to display your emails chronologically, with the ability to sort messages by Date / From sender / Subject / Size. This tutorial explains how to turn off conversation grouping in your Hotmail account (edit your "Conversation Settings"). First, login to your Hotmail account and go to your inbox: then, click on the "Options" dropdown menu in the top right corner, and choose "More options". 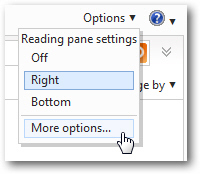 Windows Live Hotmail will load the main options screen: find the "Reading email" section, and click on the "Conversation settings" link you'll find below it. For new Hotmail accounts, the "Group messages by conversation" option is selected. To disable the feature (temporarily, since you can re-enable later on if you want), select the "Show messages individually", as shown on the screenshot above. Then, click on the "Save" button to apply this new setting for your Hotmail account. And now the same soliloquy, but with Hotmail's "Show messages individually" option enabled (conversations disabled, in other words). And this is all you need to do to disable and turn off email threads and conversation grouping inside your Hotmail account. To reactivate the feature later on, simply follow these same steps, but choose the other option inside the Conversation Settings screen.